Known widely as one of the world’s leading golf resorts, Casa de Campo is an unparalleled destination for games and sports enthusiasts. Complete with a fantastic 5* hotel, a wonderful choice of private villas, three golf courses designed and created by the infamous Pete Dye, and an array of sporting facilities, this 7,000 acre resort is sure to have something for everyone. 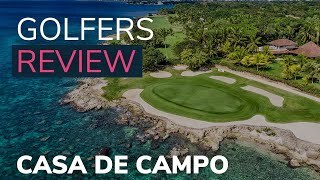 With two courses on the water and one a bit further inland, Casa de Campo has the variety to accommodate golfers of all ages, abilities, and interests. The resort’s main attraction, Teeth of the Dog, is the top ranked course in the Caribbean, and #39 on Golf Magazine’s Top 100 courses worldwide. The Dye Fore Course is all about the numbers: 27 total holes, with the championship 18 measuring 7,740 yards long, and 7 cliff-side holes with drops of nearly 300 feet down to the Chavon River make for a breathtaking panoramic. Not to be left out is the third course on the property – The Links. Reminiscent of golf courses from across the pond in the British Isles, The Links offers a unique blend specific to Casa De Campo: links golf in the Caribbean. Though it’s a bit further inland and often overshadowed by its two “big sisters,” the 2012 renovations are sure to make this course as enjoyable and trying as its counterparts. Casa de Campo Resort and Villas, located in La Romana, is on the southeastern coast of the Dominican Republic. The ideal place for family or golfing vacations, accessibility upon arrival is a major benefit. You’re afforded the luxury of choosing between three airports - La Romana International (10 minutes) Punta Cana International (40 minutes), or Santo Domingo (45 minutes) – making Casa de Campo the perfect home away from home for any vacationer. There are 7 restaurants at Casa de Campo each with different opening times and regulations. In busy periods it is worth pre-booking a table and this can be done at reception on arrival.